I have not posted some HDH updates in a while so here it goes. The way the site was set up at the moment historic data becomes meaningless and current data is skewed by old data i.e. stats from playing on a team a year ago. So I've spent the last few weeks changing the database so that the problems mentioned previously should no longer exist. A new section called Organisations has been added to the site, each record will link to a list of each orgs present and previous rosters. Each of the Organisation detail pages list out each of its previous rosters and present roster if there is one, along with start and end dates. The start and end dates are based on their first and last recorded scrim. This change allowed me to update the team detail pages so that they only show stats for the roster you select giving a better idea of how the team is doing as stats for other team rosters wont be there. This then allowed me to update the player detail pages so that they only show stats for their current roster by default. You are able to flick through their previous roster stats using the team dropdown. The pro league has also been updated so that historic pro league data can be maintained. Before I was only capturing weapon damage and it was pointed out to me that it should be capturing more than just weapon damage. So I spent the last few days altering the code to start capturing all forms of damage. These damage stats are also available on the summary pages for each game variant. Updates to the scrim summary pages have also been made. Now along the top the difference between red and blue teams overall stats will be shown. The game results table has also got a design refresh. You should also now be able to click a player record on the scrim summary page and it should filter all the weapon, medals and head to head tables for that given player. All of the aforementioned stats are then broken down per Playlist and per Game Variant using thier corresponding tabs. Users will also be able to dive into their match detail pages where all match statistics will be present. In an attempt to help professional teams and their analysists decided which maps they should veto for based on their seed at LAN events a Red vs Blue report has been developed and made live on Halo Data Hive. 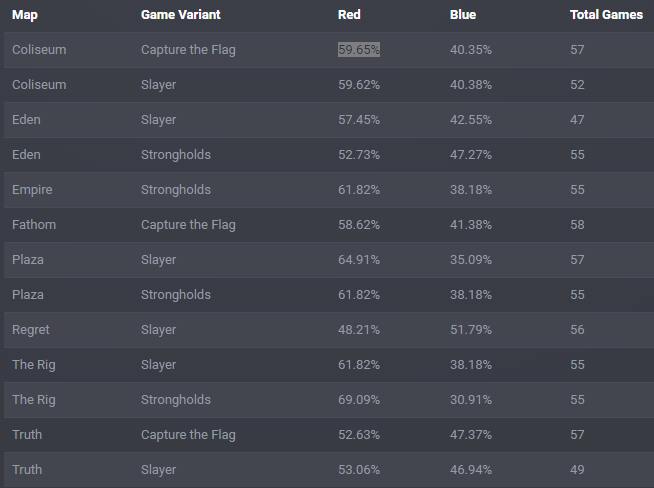 This report outputs the win and loss percentage values for each map and game variant combination. For example, red side on Coliseum has a 59.65 win percentage over the blue side based on 57 games. This report provides a game variant and To and From date filters so that the user can customise the results they want to produce based on their own requirements. A current example of the report output can be seen below. Make sure to check out the Red vs Blue report as it contains some useful information. The match detail pages have been updated to include a playable heatmap. The heatmaps are defaulted to an overall view of kill and death positions. The event points are over laid on an image of the current matches map which represents the varying death/kill events recorded over an area and a set period of time. 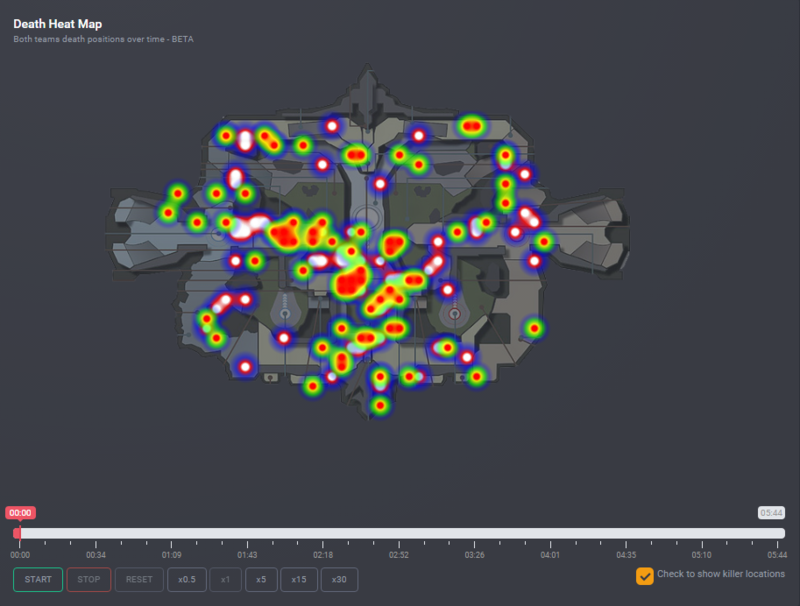 Additionally, the heatmaps are playable, so the user can click the play button and the heatmap will be cleared and as the seconds pass by more and more points on the heatmap will appear. There is also the option to toggle the killer points on the heatmaps if you are not intrested in that information. To make these event points more meaningful they have been accompanied by an even description which appears in the red timeline i.e. 00:24 SnakebiteFPS killed Cratos. A full set of match event items is available to the left of the heatmaps which includes medals earn per event. To make this heatmap playback feature more user-friendly stop, pause and playback speed buttons have been added. You must keep in mind that the map overlays used are not to scale and some points may be off. I hope that 343 provide map overlays that are to the correct scale to avoid this potential of being skewed. Also these points were calculated based on a large screen resolution so they will most likely be skewed if viewed on a smaller device. The following pages have had their design layout changed to make reading the statistic more user friendly. Previously the tables had no background and were too compact which made it difficult to differentiate different tables of stats. The new page designs now have more separation between the tables of stats to make them more distinguishable. Over the past few weeks solidified teams have started to form and with roster lock passed these flowing teams have been added to Halo Data Hive. From today onwards all the teams and player stats will be trackable. You can see how your favourite players and teams are progress as they begin their regular practice schedule. Halo Data Hive’s underlying architecture has been completely rebuilt from the ground up. The speed of the site was always a concern and on positioned of the top of a long list of tasks to complete. After many hours of work, I have completed re-writing the whole site. The increased speed should be noticeable right throughout the website from the player detail pages to the scrim summary pages. Now that the underlying architecture has been made more robust paves the way for additional updates which involve allowing users to retrieve their own stats. When you go to your account settings you will now be able to select which teams you want to receive emails for when they start to scrim. I hope people enjoy this new update. The pro league page has been updated to include more stats along with a new cleaner look. Some pages have generally been made more efficient so that they will load faster. The seed has also been made more efficient so it should grab games faster. The XMEN team has been picked up by VwS Gaming. When you register to the site you will then start to receive emails when two teams start to scrim each other. The email will provide a link to the series stats on the site along with links to players twitch streams that are currently live. Dont miss out on another game and register! I have finally taken the time to add this Update page so that I can display the recent site updates. These may range from major updates like new reports or small updates like bug fixes. Make sure to use the Contact page to let me know if you spot something wrong with the site or just want to contact me. This report breakdowns down some requested stats per map and game type. Below is a list of stats that are produced. A player weapon proficiency/slaying report has been added under the Reports link in the main navigation. This report allows the user to select one or more pro players along with one or more weapons. The main aim for this report was to allow users to see the weapon slaying proficiency of each pro player whether it is in scrims or pro league matches. A player medal/objective report has been added under the Reports link in the main navigation. This report allows the user to select one or more pro players along with one or more medals. The main aim for this report was to allow users to see which pro players were doing the most objective work along with which pros have been getting difficult kill streaks. Now that I got some free time I have been working over the past several weeks to implement the ability for "non-pro" players to look up their own stats and recent games. You will be able to type in your own gamertag and view your overall stats, weapon stats and medals stats. All of these will be broken down into per game variant and per playlist to give you a better oversight. Additionally you will be able to see a list of your recent custom and arena games of which you will be able to view full match detail along with the newly added heatmaps! This feature will be dropping within the next couple of days so be on the look out. I added a new page to the site that displays some pro league stats for players. You can filter the stats per game week. I will be adding more and more to this page as new stats come to mind. Updated the player twitch list so that players that are online appear at the top of the list. Small update but I think it adds to the site. Now on a team detail page the favicon in the tab will change to the current teams logo. Check out OpTic Gamings page.